Wings of Desire (Der Himmel über Berlin, translated literally as The Sky over Berlin or Heaven above Berlin) is a 1987 Franco-German romantic fantasy film directed by Wim Wenders. The film is about invisible, immortal angels who populate Berlin and listen to the thoughts of the human inhabitants and comfort those who are in distress. Even though the city is densely populated, many of the people are isolated or estranged from their loved ones. 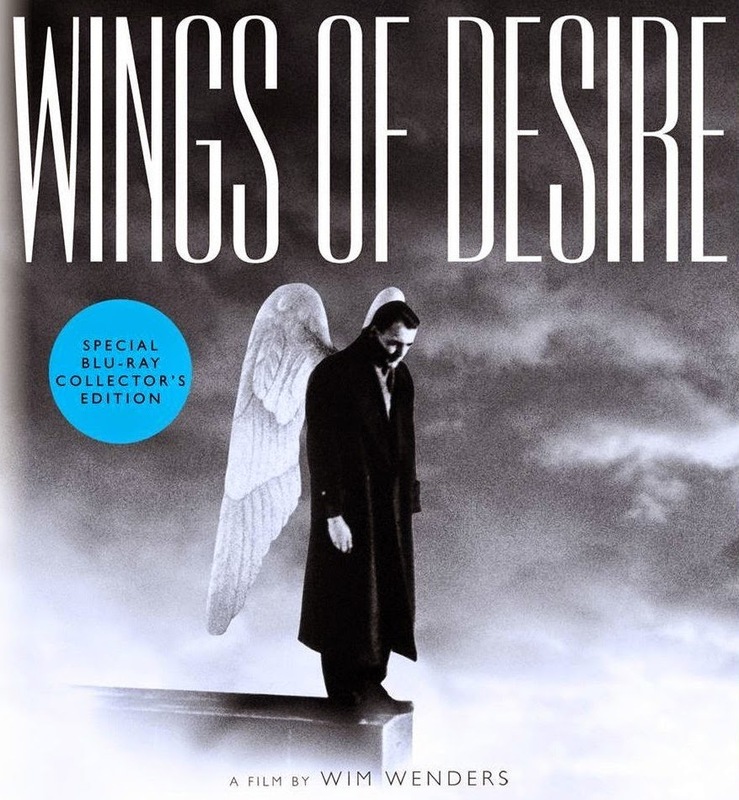 One of the angels, played by Bruno Ganz, falls in love with a beautiful, lonely trapeze artist. The angel chooses to become human so that he can experience the human sensory pleasures, ranging from enjoying food to touching a loved one, and so that he can experience human love with the trapeze artist. The film is shot in both a rich, sepia-toned black-and-white and color, with the former being used to represent the world as experienced by the angels. The film was followed by a sequel, Faraway, So Close!, in 1993. City of Angels, an American remake, was released in 1998. Among the Berliners they encounter in their wanderings is an old man named Homer, who, unlike the Greek poet Homer, dreams of an "epic of peace." Cassiel follows the old man as he looks for the then-demolished Potsdamer Platz in an open field, and finds only the graffiti-covered Berlin Wall. Although Damiel and Cassiel are pure observers, visible only to children, and incapable of any physical interaction with our world, Damiel begins to fall in love with a profoundly lonely circus trapeze artist named Marion. She lives by herself in a caravan, dances alone to the music of Crime & the City Solution, and drifts through the city. A subplot follows Peter Falk, who has arrived in Berlin to make a film about Berlin's Nazi past. As the film progresses, it emerges that Peter Falk was once an angel, who, having grown tired of always observing and never experiencing, renounced his immortality to become a participant in the world. While Damiel is omniscient and lives in eternity, Marion is mortal and lives the human aspiration to be immortal and perfect by wearing a pair of white wings (which in frustration, at one point, she calls "chicken feathers"), climbing a rope, swinging from a bar in a cheap circus, toying with death, as there is no net, and with her human clumsiness reaches upward to the grace expressed in the idea of an angel. Her aspiration is both absurd and divine. As one can take only so much of infinity, Damiel's longing is in the opposite direction, for the genuineness and limitedness of human existence in the world, perhaps a reference to Dasein, or Existenz. When he sheds his immortal existence, he experiences life for the first time: he bleeds, sees colors for the first time (the movie up to this point is filmed in a sepia-toned monochrome, except for brief moments when the angels are not present or looking), tastes food and drinks coffee. Meanwhile, Cassiel inadvertently taps into the mind of a young man just about to commit suicide by jumping off a building. Cassiel tries to save the young man but is unable to do so, and is left haunted and tormented by the experience. Eventually, Damiel meets the trapeze artist Marion at a bar (during a concert by Nick Cave and the Bad Seeds), and they greet each other with familiarity as if they had long known each other. In the end, Damiel is united with the woman he has desired for so long. The film ends with the message: "To be continued." The story is concluded in Wenders' 1993 sequel, In weiter Ferne, so nah! (Faraway, So Close!). Thank u!! I've been searching for tgis movie for a long time, finally found it on ur website. This website is a gem.